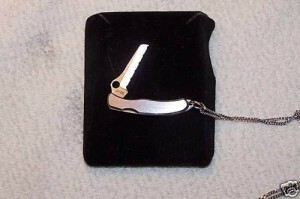 Description: The Mini Mariner is a very rare Spyderco Mini knife that comes on a Necklace chain. This entry was posted on Sunday, December 19th, 2010 at 8:03 pm	and is filed under 2" or Smaller Knives, Designer - Sal Glesser, Handles - Stainless Steel, Lock - Lock Back, Manufactured - Japan, Steel - ATS-34, Type - Folding Knife, Type - Keychain Knife, Type - Office Friendly. You can follow any responses to this entry through the RSS 2.0 feed. You can leave a response, or trackback from your own site. Does anyone have a mini police,mariner,or hummingbird for sale.Or does anyone know where to find any of these knives. Hi. I have a Mini Mariner Clipit 3001 stainless steel necklace to sell. It’s unused, boxed and in mint condition. Please could anyone advise me on where the best place to sell it would be and what a reasonable price to ask for is?